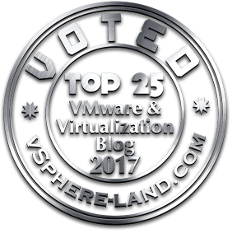 The FlashArray VMware and Commvault WP goes over the detail on how the functionality works so I won’t go into tremendous detail here, but let’s highlight some important points. First what does this integration do? Commvault’s IntelliSnap technology uses array-based snapshot functionality to create point-in-time copies of the data that needs to be backed up. This is generally aimed at short-term recovery/restore and not long-term retention (Commvault has other tech that focuses on the latter). Commvault coordinates with the end-application to create these snapshots, so the point-in-time snapshot is created in respect to the state of the application. In the VMware IntelliSnap area, it is a similar level of coordination with VMware ESXi (a VM rather) as with an application like SQL or Oracle. This coordination is centered around of course some type of quiescing, with a VMware VM is uses the VMware snapshot feature with VMware tools to quiesce the virtual disk(s) prior to taking the FlashArray array-based snapshot. This VMware-snapshot behavior is optional, but is a default. Whether you are restoring a file in the guest, a virtual disk or an entire virtual machine, the FlashArray snapshot is mounted to the host and then Commvault does what it needs to do. The recovered file, VMDK or VM can either replace the existing one or be mounted/recovered elsewhere for test/purposes or for some type of manual recovery or settings comparison. Identify a snapshot to recover from–this is simply a time range you choose (or just the latest snapshot). If you choose a time range, Commvault will identify the latest FlashArray snapshot in that time range and use that one. 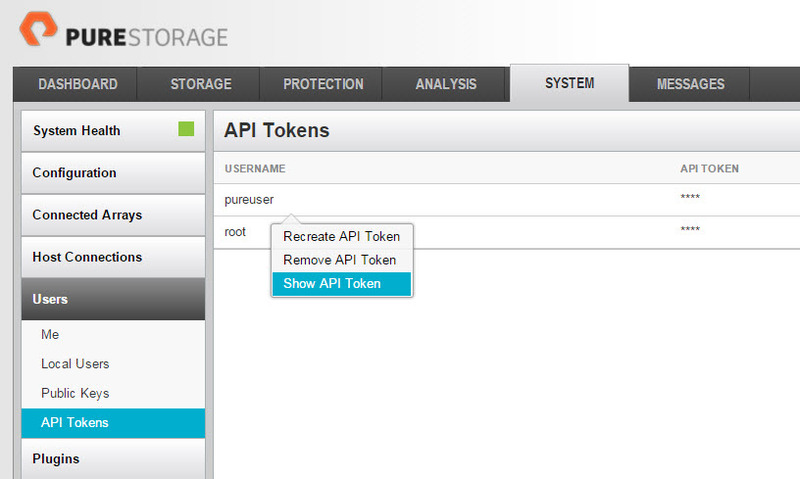 A new volume will then be automatically created by Commvault using our REST API that has the same geometry (size) as the original volume that is reflected by the point-in-time of the snapshot. The volume is then connected to the proper host object on the FlashArray as indicated in your recovery/proxy ESXi host in Commvault. That host has to be zoned and created on the FlashArray first (a one-time operation). Registering a FlashArray is a pretty simple process in Commvault–give the FQDN or Virtual IP of the FlashArray(s) and credentials. See the white paper for details on that. In a VMware environment there should be very little reason to change either of the numbers (mount retries). If mount is failing with the default settings, I would recommend opening a support case with Commvault first–something is probably screwy. Diagnostic Logging is pretty self-explanatory, the settings that might spark questions are the ones related to host groups. 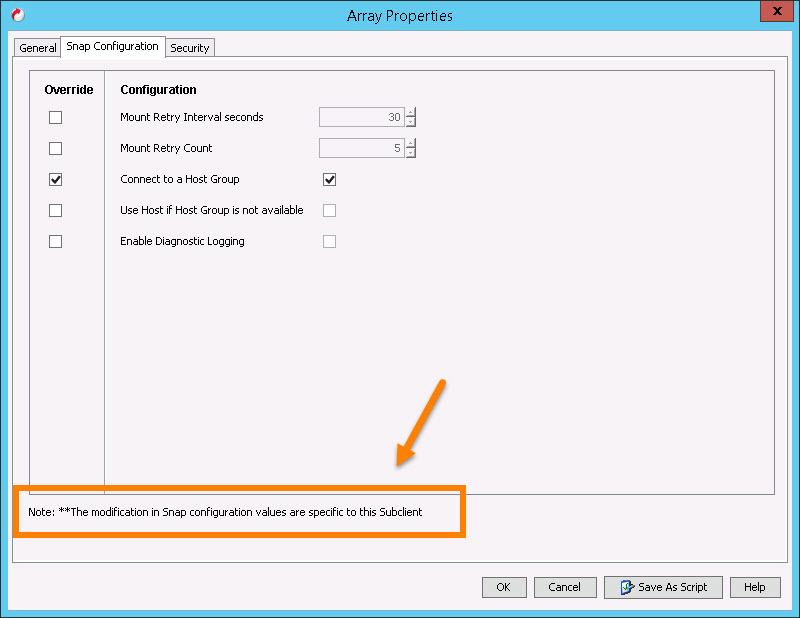 Before I continue, ALL of these settings are available when registering an array with Commvault. That being said, ALL of these settings can be overridden at a much more specific level (single operation or function). I highly recommend only changing them for discrete operations, not for the entire array. Otherwise every operation will use non-default settings unless specifically overridden. Furthermore, I generally recommend never changing these defaults unless you have a good reason. This begs the question, why not connect to a host group instead of a host? The more, the merrier, right? Well first let’s review what a host group is. A host group is a collection of host objects on a FlashArray that you can provision to atomically. In other words, you add a volume to a host group all of its hosts will get that volume. A host is a collection of WWNs or IQNs which can all be provisioned to directly. The host group is a handy provisioning object for provisioning to VMware clusters for instance. So if you add a volume to a host group, all of the hosts get it. Sweet–standard stuff. The point of contention here, is that we recommend mounting Commvault IntelliSnap recovery VMFS volumes only to one host. Why? Well Commvault asks you to select one ESXi host as the recovery host–not a cluster. So, it will only rescan that host, and when it removes that volume it will only unmount the VMFS and run a detach operation on that volume. The recovery volume is usually not meant for long term storage–it is usually meant to be used for a short term recovery operation; present a copy of an existing VMFS, extract some data from it, and then get rid of it. It can usually be cleared up with a rescan, but it is best practice to try to avoid this situation. So long story short, keep the defaults. Commvault will automatically create recovery volumes during every recovery operation–like mentioned earlier–they are meant to be temporary. So the volume and VMFS names are meant to be descriptive, while not necessarily friendly to your memory. The original datastore name is the prefix (CommVaultDS), then _GX_BACKUP_ is added followed by the backup job ID then the Commcell ID and then the archive file ID for that backup. 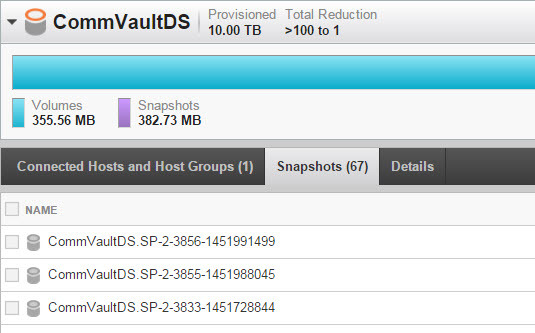 The Commvault IntelliSnap technology skips steps 1 and 2. Instead when registering your FlashArray just supply it with your username and your API token which can be retrieved from the FlashArray GUI or CLI (or REST if you so choose). So that’s the general stuff to know about Commvault IntelliSnap and the FlashArray. Read the white paper for more details on the exact workflows. Refer to the following narrated videos for examples of the different recovery process as well.